The victorious DCU women's hockey side. Image credit: DCU Hockey. The Halloween weekend was a fruitful one for DCU Hockey, with both sides taking home medals in the plate competition, while first-year student Sarah Torrans made her debut for the Ireland senior women’s side. 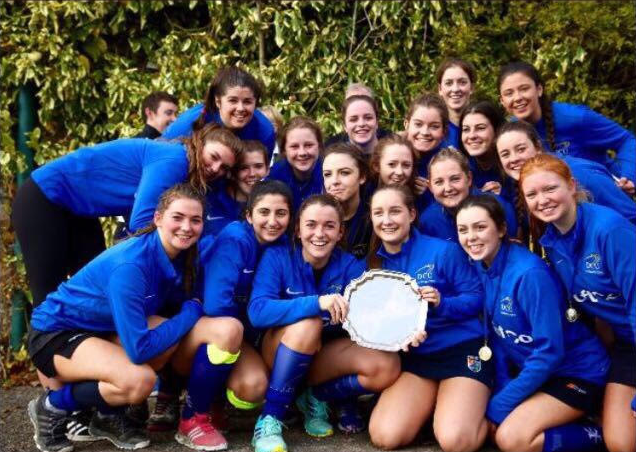 The women’s side took home the top prize in the plate while the male side finished third in their competition, while Torrans capped a meteoric rise through the Ireland underage setup by putting in a starring performance in Stormont. Torrans, speaking with The College View, did say her call-up was somewhat unexpected, but she was overawed by the chance to play for the senior side. “Of course it was a surprise,” she said. “At 18 years of age I would have never thought of getting my first cap so soon. “I was always hoping some day I’d get called in but never thought it was going to come as quick as it did. “This time last year I was injured and never thought I’d have such a successful summer to lead me to where I am now. Torrans then assisted the DCU side to plate success at the intervarsity tournament, helping them gain promotion to the Cup competition next year, where they will face the best hockey teams in the country. Claire Byrne from the women’s side spoke about their expectations, saying that the standard in hockey in the college is rapidly improving. “The girls team had recruited a number of extremely talented new players including Sarah,” she said, “while also maintaining the core of the team from previous years, so the minimum expectation was to reach the final of the plate with the ultimate goal being promotion to the Cup. “The health of hockey in DCU is quite strong. The scholarship scheme enables DCU to attract top talent within the school and youth setups in Irish hockey. “Another aspect, which we are delighted about, is we had more signups for the Hockey society this year than any other year.